I'm in the line for a new amp. I've been using a Fender champion 40 for 2 years and its not really working, doesn't sound good with my DS1, and it can get muddy and harsh. So I'm looking for a new amp and I'm drawn to fenders. I will be gigging it with a drummer and bassist, playing loud, ideally want it between 30-60 watts or so but I don't mind, with a 2x12, 2x10 or 4x10 config, heads are also fine. I'm keeping my budget at £600. Sidenote, saw a 4x10 80's Fender Concert which looks good, used, for £550 but its quite far away from me. Thoughts? If you like a tweed sound and don't need onboard reverb you can get a used 59 Bassman reissue for $750 to $800 (that's about the lowest current price) on Reverb in the US, which would translate to around 500 to 600 pounds. I dk what's available across the pond. Yeah I've looked at those. Not many for under £8-900. honestly. the ds1 usually doesnt play fantastically with those champion. try a rat, imho it tends to work better with fender solid state amps. i use a deluxe 90 with my 72 bassman. i recently gigged with a fender vaporizer. while not the cleanest amp in the world, it was plenty loud for 18 watts. if your budget is around around £600, there is a lot of good out there. 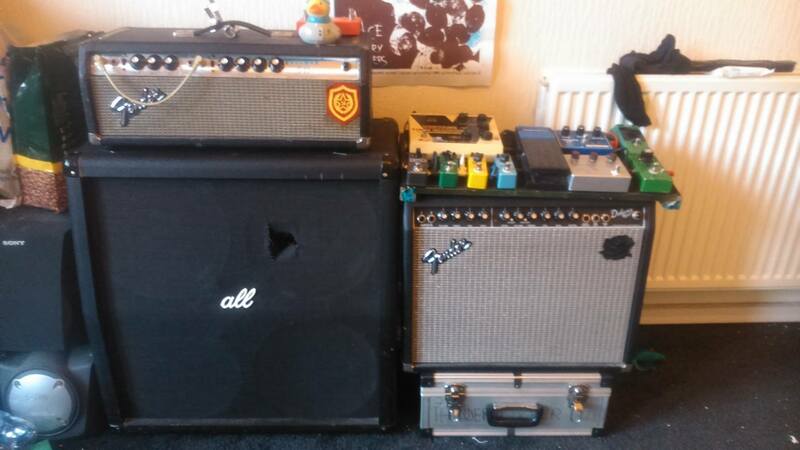 my bassman and marshall 4x12 only cost me £420 (teh weed number) when you add up how much i payed for the deluxe 90 and an ABY box, it's around £500. if your part of the scottish buy and sell group, keep an eye out for hotrod deluxes and hotrod devilles. next time your in glasgow, i can show you around some good places to buy cheap gear. edit: just because i want to. I had a Concert 410 for a few years. Great 3D cleans, meh overdrive with too many knobs. Heavy. Last of the hand wired Fenders. 60s concert 410. Brown or black face. Concert (II - since it was in the same series as the champ II, deluxe Reverb II, Princeton II, etc. ). Rivera era. Came as a head, 410, 112. Hand wired, two channel with a proprietary foot switch. But there are these too, and neither is particularly remarkable or valuable. Concert Amp. 410. Circuit board. Worth going to Essex for? Brownface Vibroverb reissue from the 90s. 40 watts, 2x10, big reverb, awesome bias vary tremolo, and killer distortion when you crank it. edit: it looks like they're going for way more than I realized. But I got one recently for a price well within your budget so you never know. Last edited by Horsefeather on Sun Apr 07, 2019 12:54 pm, edited 1 time in total. Is this the Jeff Buckley amp? Because if so, YES. Yes, the Vibroverb Reissue is the amp Buckley used. I’d pass on a drive for that one for that much. Absolutely pass of it’s not even the Rivera one. Fender amps are pretty cheap and plentiful here in the US, so that may skew things. Not many interesting choices in Scotland right now. It is the handwired Rivera one but I would much rather wait I guess than drive that way. Seen some videos, really nice cleans, didn't mind the overdrive that much but yeah. There was a silverface bassman 100 head for sale for a while which looked nice but that got snapped up.